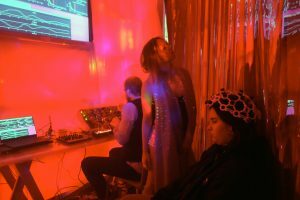 Spiritual Lap Dance is a performance by choreographer Carima Neusser and visual artist Per Hüttner presented at Winslow Garage in Los Angeles. 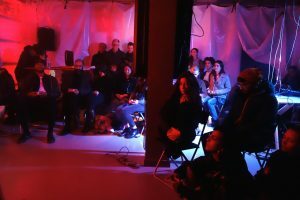 The individual members of the audience are invited one by one to sit on a chair in the virtually empty and dark garage. In the dark there will be loud music, spiritual matters addressed and some dancing. Very little of the higher brain functions will be activated. 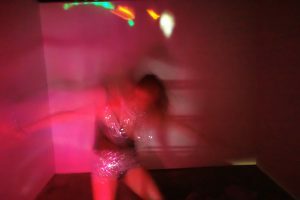 Spiritual Lap Dance in Los Angeles is supported by the Swedish Arts Council, The City of Stockholm and Helge Ax:son Johnsons stiftelse. A second version of Spiritual Lap Dance is performed. 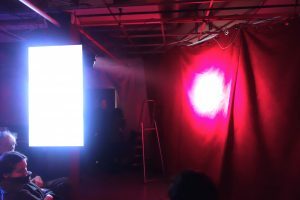 The project joins forces with the EEGsynth team and Daniela de Paulis Cogito project at La folie numerique. 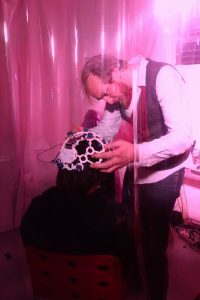 During the event a select number of members of the audience will create music in dialogue with Stephen Whitmarsh and Carima Neusser using their brain waves and the EEGsynth. Carima will try to influence the person with the EEG head-set through her presence in the space. Everyone in the audience is given a special eye that they will try perceive the performance with while their normal eyes are closed.